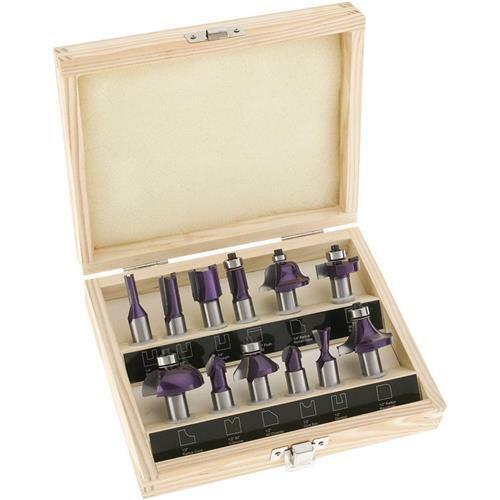 If you are just starting a router bit collection or need to replace some old worn out bits, this set of super-duty micro grain bits is the perfect choice. Exceptional quality and finish, best bang for the buck. These router bits are inexpensive and based on limited use, are already beginning to dull. It is a good set to have based on the variety included, however, do not expect to get much life out of them. The roundover bit has about 10 linear feet of use in pine is already beginning to show more tearout. The set is not bad, just remember you get what you pay for. I would recommend this for a beginner, so they could figure out which bits they will use the most. Once that's established, you can buy a few nicer bits. I bought this router bit set because the 1/4" shaft bits I had were flexing too much in the oak I was creating arches with. The 1/2" shaft bits gave me the machined finish I was looking for. I will ultimately route about 180 feet of 5/8" oak with the 3/4" bit before the project is done. I am about halfway done at this time and the bit is still sharp. Bargain router bits can be a bit of a hit or miss affair. These bits are a hit thus far. If you are on the fence about these bits, I hope this review helps you decide. Very nice. Haven&#39;t had chance to use yet, but look like good quality and came in nice wooden box. Bought this set and it is my first set of router bits! Quality and price made this purchase a no brainer! Will be buying more bits as my level of expertise grows.Grizzly's router bit sets are perfect for the beginner as well as the accomplished wood worker!